An essential home-team for the first time in the Super Bowl, as Super Bowl XIX returns to the sunny state of California in 1985, our latest stop on the Road to the 2018 Super Bowl in Minneapolis. Played at Stanford Stadium in Stanford, California, the NFC-champion San Francisco 49ers would play an essential home game in their Super Bowl XIX matchup against the AFC-champion Miami Dolphins. 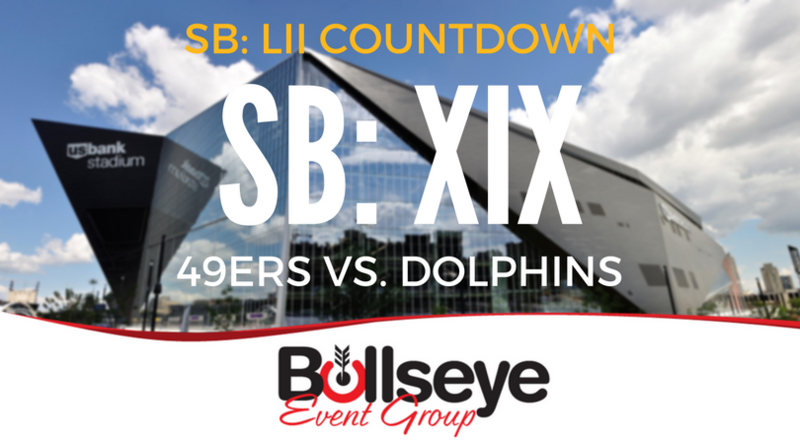 In front of over 84,000 fans, the 49ers would take Super Bowl XIX, defeating the Dolphins by a score of 38-16. Leading up to the big game, the biggest spotlight was easy to spot; the quarterbacks. Two Hall of Fame QB’s, San Francisco’s Joe Montana and Miami’s Dan Marino, would be going head-to-head for the first time in the Super Bowl. Each of the quarterbacks would throw for more than 300 yards total, but it was Montana who would get the best of Marino this time around. Super Bowl XIX was also a first in many other areas. The game was broadcast for the first time on ABC, and President Ronald Reagan became the first sitting president to participate in the pre-game coin toss ceremony, taking part in a televised even directly from the White House. The cost for a commercial during Super Bowl XIX sharply increased to a whopping $525,000 for 30 seconds of air time, with more than 85.53 million viewers watching the big game.